If you have missing teeth that were lost as a result of decay or trauma, enjoying your favorite foods can be a challenge, and it can also take a toll on your self-confidence. While a dental bridge or implants may be a better alternative, especially for those interested in permanent dental restoration, these options may be cost-prohibitive for some people. Partial dentures make it possible to fill the gap in your smile, enjoy a variety of foods, and improve your self-esteem for a fraction of the cost associated with permanent dental restoration procedures. Despite these benefits, however, there are some drawbacks in that partial dentures can alter the taste of some foods and may take a while before eating with them feels natural. Commonly referred to as “false teeth,” partial dentures are plastic dental appliances that are designed and molded to fit the unique shape of your mouth and serve both a functional and aesthetic purpose. Like any other dental appliance, many people find getting used to them especially challenging as they tend to feel uncomfortable and may slide around because of the saliva in your mouth. Also, if you have recently had any teeth extracted, partial dentures can irritate your gums until they have had time to heal. That aside, once you have gotten accustomed to wearing them, you will never want to go without your partial dentures again. Not surprisingly, eating food within the first few days of getting your new partial dentures may feel awkward. In fact, many first time wearers have reported their partial dentures have become dislodged while eating. Also, many have complained about small particles of food becoming trapped underneath their dentures. However, it is important to note that these events are not uncommon, so you needn’t feel discouraged as you will learn to overcome these challenges over time. The best way to become acclimated to your new partials is by starting with soft, bite-sized foods like cereals, fish, and pasta, for example. In doing so, you will quickly learn to adapt to eating foods with them, and you will eventually be able to move on to more challenging foods like rice and certain cuts of meat. Partial dentures can be used to fill any gap in your teeth; however, if partial dentures are being used to fill a void in your front teeth, you may find that biting down on certain foods like apples and corn on the cob, for example, using your incisors may be difficult. Again, this is part and parcel of getting accustomed to wearing dentures, and you will be able to overcome this hurdle in time as well. 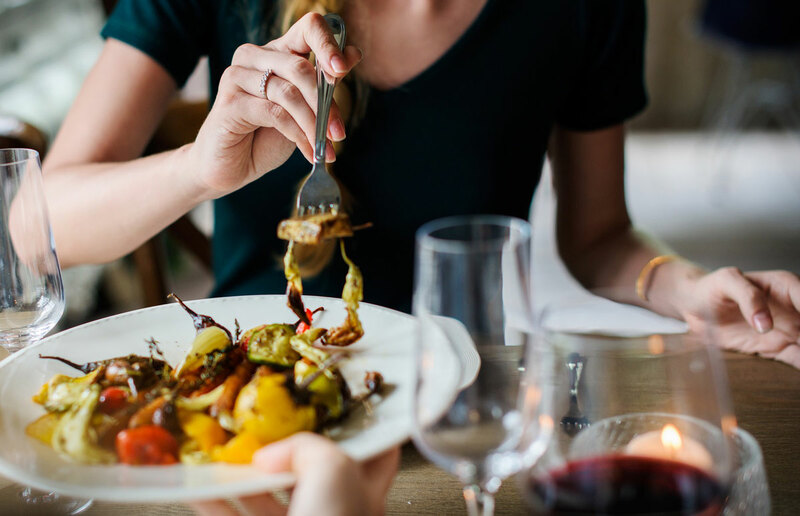 However, while you’re getting used to biting down with your partials, it may be a good idea to avoid these foods or use denture adhesive to help reinforce them while eating foods these specific foods as well as other more challenging foods. Although it may be difficult to abstain from these foods, you will be doing yourself a tremendous favor by avoiding them as they can potentially damage your partials or cause discomfort as food particles become stuck underneath them. All in all, eating with partial dentures is entirely possible; however, there is a steep learning curve.